In need of some DIY home decor ideas? 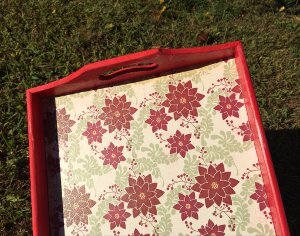 Try this Lovely Mod Podge Tray. This tutorial will take a plain wooden tray and turn it into a decorative platter perfect for serving. It's an easy woodcraft that will take you almost no time to complete. Choose a paint color and fun paper to match your other home decor. To really make the bottom of the tray pop, choose patterned paper. This is a great way to spruce up your home decor. Apply a coat or two of paint on your tray and let it dry. Cut your pattern paper to the size to fit into the tray. Take your mod podge with a foam brush and put a coat of mod podge on the wood and apply the paper to it. Let that dry and apply a "sealant" coat of Mod Podge. You're done- Enjoy! Even though this project is titled to be a Christmas tray in the video, the red color caught my eye and in could see this as a 4th of July summer tray in red, with white and blue accent colors. Of course you can create this in any colors to suit your decor or the holiday of your choice. It is a lovely and practical project and you could even upcycle a found tray at an estate or garage sale for even more cost effectiveness ....thanks for sharing a great idea!